This smoked venison recipe is dynamite. So tasty, you will eat yourself sick. 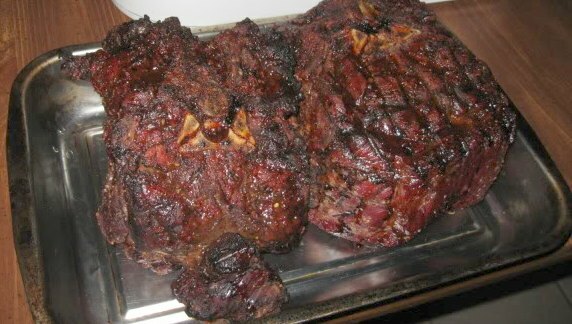 So enjoy these venison and wild game recipes. Many more venison recipe links at the bottom of the page. Trim any silvering or fat from the meat. Place a few slits along top of the meat and fill with the minced garlic and bacon. Completely brush with oil and season with freshly ground black pepper. Pour 1/2 cup wine into water pan of smoker and fill with water; put in place over hot fire. Place a pan below the meat to catch the juices to make gravy. Place the meat on the rack and smoke meat according to smoker's manufacturer instructions - approximately 5 hours. The meat is done smoking when the internal temperature reaches 130 to 135 degrees. Take the meat out and place in a large stock pot or dutch oven. Pour the remaining wine over the meat and continue to cook on simmer for approximately 45 minutes or when internal temperature reaches 165 to 170 degrees. Place the bacon in a heavy frying pan and fry just until done, but not crispy. Sprinkle the flour in the pan and cook/whisk for a couple minutes and add the juices from the smoker pan. Now slowly add the broth and continue to cook until thickened. Taste it and add salt and pepper if needed. Serve the meat hot (or cold) with gravy. The leftovers can be sliced and placed in a skillet. Pour some of your favorite barbecue sauce over the meat and heat through. Serve as sandwiches. Delicious not matter how you serve it. Please feel free to check out more easy venison recipes below.